Day by day counterfeit drugs come into market. Some of the expired drugs make back to the market after being relabeled with new expiry date. These are worst criminal activity against human kind. Patients think they will be cured by taking the doctor prescribed drug, but instead of consuming regular medicine they may be consuming counterfeit or expired drug. This could lead to adverse effect and even to death. 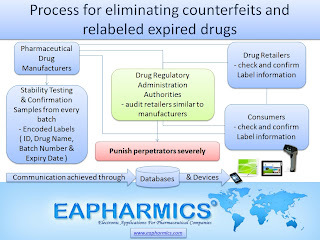 Every government (especially the countries that have more percentage of counterfeit and relabeled expired drugs) should counteract against these counterfeit drugs and expired drug sales through their regulatory administrations. 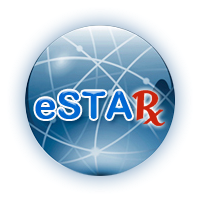 Each and every medicine in the market all over the globe should be traceable and if needed at a single tablet level. Every batch produced by pharmaceutical companies should have encoded unique id, batch number and expiry date. Some of the samples from every batch go through the stability tests which are periodically inspected by Federal governing agencies. Confirmation samples from every batch should be stored. Labels used in these samples should give all the information of the drug that is marketed and easily tracked. Each pharmaceutical company should have a system through which their drugs, batch number and expiry date can be verified by means of communication. At this communication age that should not be an issue and be easily achieved through databases and devices, cost effectively. Every country should have proper Drug Administration Authorities and process in place. All the manufacturing pharmaceutical industries should perform stability tests and account for all the drugs they are manufacturing. Drug authorities should do regular and surprise audits to make sure the stability tests are properly conducted and confirmation samples are properly stored. Encoded labels should contain all the required information along with the unique id, drug name, batch number and expiry date. Drug Administration Authorities should also audit the retail stores regularly or surprisingly and perform drug information validation and confirmation with the drug manufacturer along with the expiry date. Also every drug consumer should have the ability to check with the manufacturer that the drug is a genuine drug. If any discrepancies are noted drug administration authorities should have authority to administer severe punishments to perpetrators, which will deter them to manufacture counterfeit and sell relabeled expired drugs. When every piece of drug manufactured is accounted for, it will become very difficult for manufacturing counterfeits and relabeled expired drugs to be let into the market. Also this drug accountability will help in proper disposal of expired drug, which otherwise might enter the environment and cause potential damage.